Need a filling lunch or snack? 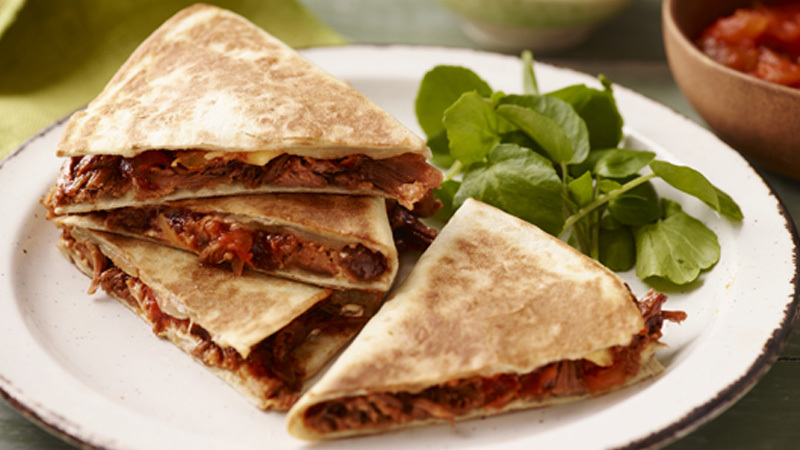 Use a pack of pre-cooked barbeque pulled pork and these delicious quesadillas are ready to eat in no time! Preheat the oven to 200ºC (180ºC for fan assisted ovens), gas mark 6. Cook the pulled pork following the pack directions then using two forks shred the meat and stir in the barbecue sauce from the pack. Spread half of each tortilla with some of the soured cream. Top the cream with 1/4 of the pork mixture, 1 tablespoon of the salsa and 2 half-slices of cheese. 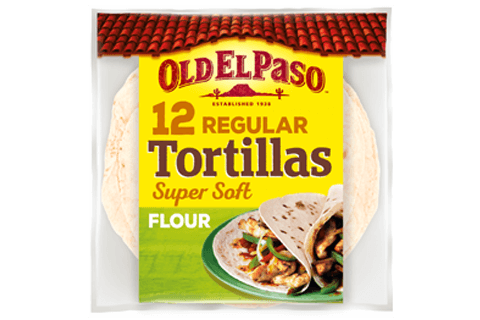 Fold each tortilla over the filling to make a semi-circle and press down gently. Heat half the oil in a large non-stick frying pan over a medium heat. Add two of the quesadillas and cook for about 3 minutes, turning once, until the filling is heated through and the tortillas are golden. Repeat with the rest of the oil and remaining quesadillas. Cut into wedges and serve with the rest of the remaining salsa and soured cream. Look out for packs of pulled pork with barbeque sauce in large supermarkets. If unavailable, use shredded left over roast pork heated in saucepan with 6 tablespoons bottled barbecue sauce. Instead of the cheese slices you could use grated mozzarella cheese or crumbled goats’ cheese.